Everything was perfect. The location was great, the apartment was comfortable & had everything we needed. The hosts were fantastic. We really enjoyed the homemade jam, juice & grappa. We only met Julija very briefly & she seemed lovely. Domen was a great help. He helped us get our luggage to & from the apartment & gave us the use of his car park card so we could park at a much reduced rate (parking is an issue in Piran if you want to be in the old town). We had some great conversations with Domen & it was really interesting to get a little insight into life in Slovenia today. Piran is gorgeous. Highly recommended. The host is super friendly and accomodation is awesome. Very nice place to relax, no cars in the city. To get to the appartement you have 15 minutes that you can enter with the car, the host helps you perfectly and you'll be settled in no time. The local free bus is very convenient. You can park your car outside of the city where the bus picks you up every 5-10 minutes. Everything. Very nice host. Amazing flat. Really good location. Would recommend any day. The location of the property was excellent. The hosts were very kind and helped us with the luggage from the public car park to the accommodation. The home made marmalade jam, fruit juice and the liquor given to us upon arrival was great. There were enough pots, pans, crockery and utensils in the apartment plus anything else you can think of to serve 50 guests. Very nice, well furnished and equipped apartment. We did not miss anything. Very nice, helpful owners Julija and Domen. Great location in the center of Piran. Near the port, main square, shop and bus stop. Delicious jams and juices made by the owners. I recommend to everyone. Everything was excellent. Far better than what we expected for a last minute booking. The apartment was very clean and modern, one of the best locations we have stayed at on our European vacation for the price. The wifi was very good and the kitchen had everything you could want. The hosts were excellent, very friendly people and easy to reach if you need anything. We have no complaints. Piran is a beautiful town!! I hope we can return one day. Very clean and comfortable appartment! Appartment is very good situated! Julija and Domen are very hosty. Everything was perfect! Tolle Lage. Sehr freundliche Gastgeber. Viele nette Lokale in der Umgebung. Lock in a great price for Nono Mario – rated 9.8 by recent guests! Located in Piran, a few steps from Tartini Square and 1.9 miles from St. George's Parish Church, Nono Mario offers free bikes and air conditioning. Housed in a building dating from 19th century, this apartment is 2.3 miles from the Fiesa Lake. The apartment consists of 1 separate bedroom, 1 bathroom with free toiletries, and a seating area. A dishwasher, an oven and a microwave can be found in the kitchen. This property also has one of the top-rated locations in Piran! Guests are happier about it compared to other properties in the area. This property is also rated for the best value in Piran! Guests are getting more for their money when compared to other properties in this city. 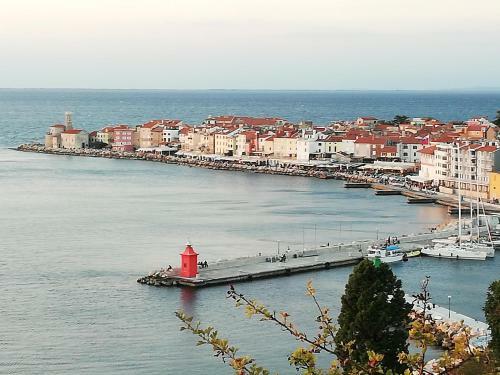 뀐 Located in the top-rated area in Piran, this property has an excellent location score of 9.9! When would you like to stay at Nono Mario? This apartment features air conditioning, tumble dryer and satellite TV. It is recently renovated apartment (2+1 person). The apartment is fully equipped with oven, fridge, freezer, microwave oven, toaster, dishwasher, hairdryer, pull-out sofa for two and pull out sofa for one, KTV and it is air-conditioned. We are Julija&Domen and we have two sons. We like to cook, running, hiking, gardening, play volleyball... and many other activities so we are always in motion. We like to make home-made treaties (juices, jams, sausages, pancetta, olives, egg plants in olive oil.......) and we like to surprise our guests with it. We love good food and drinks but not only to eat - also to make some local dishes. If you want some advice about local amenities we will be happy to give you some tips to spend in Piran the best holidays - and you will see that Piran has a special charm. Since we like the interior designing we designed the appartment entirely with our own ideas and also most of furniture was designed by ourselves because this is another passion that we share. The main idea with furnishing the appartment was to make it a cosy, practical and nice so the guests can feel welcome and have a home-like experience. Piran is medieval town with rich historical sights. You can enjoy discovering numerous small streets with old houses. For us the most beautiful thing is discovering the maze of small streets and amazing architectural solutions that had to be done due to lack of space and distinctive features of Piran. Due to this fact Piran is really an outstanding experience especially for the people living in big cities. In Piran we basically all know each other and we are overcoming all the differences among us. Piran for us is the most beautiful city to live in, although we have some traffic problems, but at the end of the day it is a small price to pay to be able to live here. The most important thing for anyone that comes to Piran is to discover a mediterranean cuisine and even more important - a mediterranean way of life. These are the features that makes a difference, but please don't take my word for it, you will have to find out by yourself. House Rules Nono Mario takes special requests – add in the next step! Please inform Nono Mario of your expected arrival time in advance. You can use the Special Requests box when booking, or contact the property directly using the contact details in your confirmation. Not having free access to washing machine when needed. Even if I wanted, I could not find any downsides.